The Flow Cytometry laboratory performs DNA content and cell cycle analyses of solid tissue specimens. 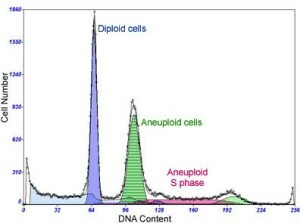 The laboratory’s special expertise is in DNA content measurements of premalignant diseases of the GI tract, such as Barrett’s esophagus and ulcerative colitis, where the finding of DNA content abnormalities is associated with elevated cancer risk, and the determination of ploidy in the differential diagnosis of molar pregnancies. If you are a research lab and are interested in using the Pathology Flow Cytometry Core Facility, click here for more information.